City officials unveiled their public safety and security plans Wednesday for the 123rd Boston Marathon. With the Boston Marathon just around the corner, officials revealed their public safety and security plans for the athletic event on Wednesday. 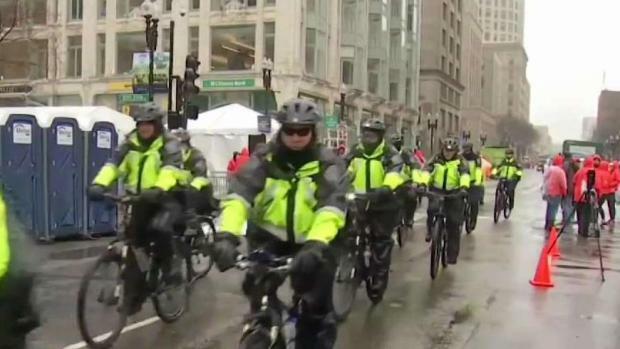 Although officials said there are no credible threats against the marathon this year, they say they're preparing for anything and everything. Seven thousand law enforcement officials will be working to keep eventgoers safe. About 1 million people are expected to attend the 123rd Boston Marathon. Security checkpoints will be deployed throughout the event, so officials suggest attendees to leave their bags at home if possible. The tragic bombings that targeted the marathon in 2013 changed the way security is handled at the event. "It's been six years since terrorists struck at the core of our city," FBI special agent in charge, Joseph Bonavolonta, said. "And the worst thing we can do is become complacent or too comfortable. If you see something, say something." "A lot of people can remember where they were on certain dates. I certainly know where I was April 15, 2013 at 2:49 p.m. I was on Boylston Street and I’ll never forget that," Boston Police Department Deputy Superintendent William Ridge said. "I’ll never forget what happened. And the men and woman of the Boston Police Department, as I said before, they kind of take it personal, what happened that day." Massachusetts Emergency Management Agency headquarters will act as the Unified Coordination Center on race day, according to MEMA. The UCC will host 250 liaisons representing 70 federal and state agencies as well as several non-profits and private companies that will coordinate safety operations. This year’s Boston Marathon will be on April 15, the sixth anniversary of the tragic bombings.